Today let's make pancakes (or waffles) for dinner! 9 Canadian food bloggers have shared their best savoury pancake and waffle recipes - everything from the classic chicken and waffles to savoury mexican waffles with salsa verde and everything in between. Enjoy! 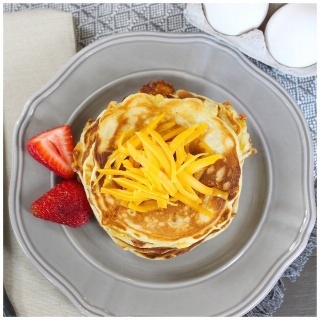 **[Golden Penny Cheese Pancakes](http://amidstthechaos.ca/2015/04/golden-penny-pancakes/)** from **Amidst the Chaos**. **[Maple Bacon Waffles](https://tinysweettooth.com/2016/03/23/maple-bacon-waffles/)** from **Tiny Sweet Tooth**. **[Chana dal Cheela: Savoury Husked Split Desi Chick Pea Pancakes](http://www.cookingsutra.com/chana-dal-cheela-savoury-husked-split-desi-chick-peas-pancake-gf/)** from **Cooking Sutra**. **[Vegetable Pancakes with Carrots and Spinach](http://veganlovlie.com/2015/04/vegetable-pancakes-with-carrot-spinach.html)** from **Vegan Lovlie**. **[Chicken and Waffles](http://clockwatchingtart.blogspot.ca/2014/01/chicken-waffles.html)** from **Clockwatching Tart**. **[Savoury Waffle Sandwiches](http://homemadeandyummy.com/waffle-sandwich/)** from **Homemade and Yummy**. **[Lentil Pesto Pizza Waffles](https://swirlsandspice.com/2015/02/13/lentil-pesto-pizza-waffles/)** from **Swirls and Spice**. **[Corn, Jalapeño and Queso Fresco Waffles with Salsa Verde](http://www.mykitchenlove.com/savoury-mexican-waffles-with-salsa-verd/)** from **My Kitchen Love**. **[Vegan Avocado Waffles](https://shipshapeeatworthy.wordpress.com/2016/03/22/recipe-roundup-vegan-avocado-waffles/)** from **Shipshape Eatworthy**. RELATED: Canada's Craft Beer: Craft Beer Pancakes! Thanks so much for including my entry along with some very talented food bloggers. Great pictures too.. So many great ideas to take pancakes and waffles from breakfast to dinner!